The Pedal magazine definitely addresses Canadian cyclists, because their focus is clearly on the Canadian bike section. Let it be Canadian cycling heros, the national cycling team of Canada, or fascinating bike events or tours in or through Canada. As they also got a buyer’s guide, featuring national and international brands, they aim at consumers and people who are crazy about cycling. Most of the content revolves around the Canadian cycling scene. Many articles are about Canadian sportsmen and sportswomen, involved in racing or the biking culture in general. It’s not limited to a specific genre, such as mountainbiking or road cycling, it’s more a wild mix of themes. Besides reports from events and achievements, it also covers news and general issues around cycling. Furthermore one can find a buyer’s guide on bikes and the right gear, such as helmets, parts or clothing. With on average about 100 pages per issue, it is not specifically long nor specifically short. It has different departments such as “tread”, “Out in front”, “Clubs” or “back pedaling”. It is generally split into four sections which are “Special features”, “Gear”, “Competition” and the “Departments”. The first one contains mostly rider’s profiles and reports from events or on important / controversial issues. “Gear” features bike tests and reports on special equipment such as a dropper seatpost for instance. In competition it is all about how Canadian bikers performed in national or international events. Ads have no indicators which mark them clearly as an advertisement, which we find to be bad. On general, about every other page is an advertisement, which is mostly one page or sometimes half a page long. Ads are predominantly in English, but sometimes they are – understandably – in French. As the articles are usually one page long, the ads beside them don’t interrupt that much. Longer features such as a buyer’s guide or a longer article, are not interrupted by advertisements at all, which we liked very much. The front used throughout the magazine is rather small, but can be read well. Many of them are continuous texts, without captions, which need the reader to focus fairly hard. As the texts are written very well and are nice to read, it is not that much of a drawback. The tests go to great depth, although information on the bike’s geometry apart from the headtube and the seat-tube angle is missing. It has a big focus on a written review rather than many pictures, or helpful charts and tables. 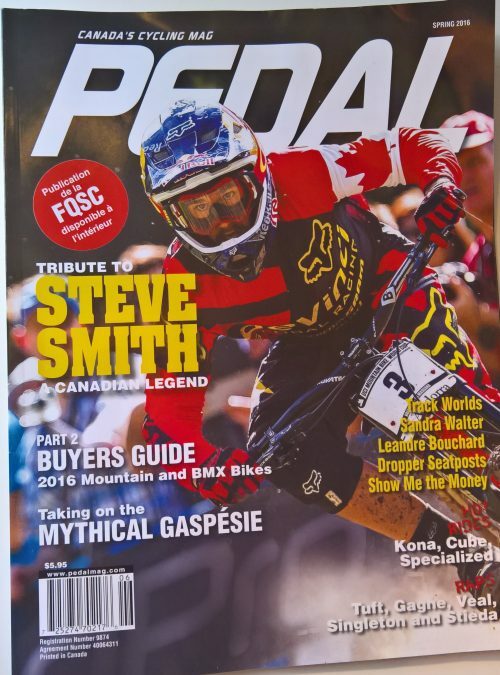 If you are into long texts and kind of an “old school” styled magazine – Canada’s Cycling Mag is just your cup of tea.